ABM Inventory management software is a cloud based inventory system designed for retail, online retailers, wholesale and distributors, e-commerce. Automated inventory management system is intended for stocks and orders automation: decrease in overstock level, lost sales control. Stock system ABM Inventory is compatible with any ERP or accounting system. Request a demo! The aim of the system is to provide continuous goods availability in required quantity at the right place and in due time; reduce the surplus level (over-stocks) due to decrease in out-of-stocks, consequently mitigating lost sales; release current assets. ABM Inventory — is a saas inventory management software for retailers and online retailers, distributors and wholesales, all supply chain and final points of sale. It is designed to automatically calculate the required stock level for each SKU (stock-keeping-unit) every day at each stock location in accordance with the actual demand fluctuations. Owing to online inventory management system ABM Inventory, high level of goods availability with optimum inventories is provided! Unique algorithm that calculates daily replenishment according to Theory of Constraints methodology. Does not require purchase, installation and support. It is compatible with any accounting or ERP system. Fast payback period. Improvement of all work processes with orders, inventories, assortment, suppliers. ABM Inventory beneficially differs from other systems because here the inventory management is based not on the illusive forecast, but on the actual consumer demand, which is very dynamic. It is successfully used in retail, distribution, production. Inventory software ABM Inventory provides great opportunities. Inventory automation in ABM Inventory allows to monitor sales dynamics, lost sales, inventories and their surplus throughout the whole company, each warehouse, store and supplier. A simple and precise system of reports is implicated in ABM Inventory. Reports are brought out compactly, allowing to estimate a general picture and, if necessary, to go deep in more detail. More than 40 reports are intended to complete specific tasks. Daily automatic buffer determination according to changes in real consumption of each SKU on each point of storage. Every day the actual sales are analyzed automatically on each SKU, available surplus and shortage on each point of storage are estimated, specific delivery conditions are taken into account. Based on these data the system creates supplier orders. Management of promotional actions and seasons. Lack of TOP mover items signals about insufficient key items stock generating the main turnover (to 80%) and risk of lost sales. The manager takes preventive measures for alignment of ensuring storage with item of a point. Report on order execution accuracy by suppliers contains information on how many items were ordered and what quantity was actually supplied. Financial performance indicators are provided which allow to reveal and easily compare fast moving SKU with slow moving, and also immovable SKU. Goods are ranged on profitability, turnover. Convenient mechanism of products withdrawal from assortment. Consolidated information on supplier turnover, his top line items, lost sales, surplus, inventories and turnover, indicator dynamics and a resultant indicator of supplier reliability. Dynamics of inventories in the company. Every week the system automatically calculates effectiveness of inventory management in general and at each point of storage. How the situation changes and what influences these changes. Lost sales analysis. Out-of-stock analysis in each point of storage and their influence on financial results of the company. Dynamics of excess stocks. The detailed report on overstock level. Reports reflect tendencies during the last 6 and 52 weeks, and also detailed reports with highlighted line items that created the greatest lost sales and surplus last week. Сost of inventory management system ABM Inventory includes the cost of implementation and the cost of a monthly service. Reducing lost sales by 30-60%. Due to high goods availability level, lost sales are minimized, customer loyalty increases. Decrease in overstock level by 35-60%. Release of money frozen in surplus stocks. Decrease in need for borrowed resources. Losses minimization. Reduction of losses that appear as a result of write-offs and sales. Storage costs and goods movement between warehouses decrease. The company’s financial performance improvement. Supplier reliability level increases with accumulation of statistics and reports on supplier reliability, which shows which supplier and how often delivers goods with delay, therefore creating the wrong quantity. It allows to work only with the most effective ones. Rational use of warehouse capacities. ABM Inventory is a cloud-based solution, works according to the SaaS scheme (Software as a Service), so the Customer does not incur additional expenses connected with installation of excess equipment (like server, etc.) and system support. The system is implemented and successfully works in large retail chains, distribution and production companies in the CIS countries and Europe. ABM Inventory best inventory management software for retail, online retailers, e-commerce and wholesale. In terms of fierce competition in current market, optimum inventory optimization system has vital value for business stability, its development and growth. The automated inventory management gives the opportunity to attract bigger number of consumers, increase sales volumes and discover more opportunities for business growth. With inventory optimization solutions, you can forget forever about intuitive calculations and unprecise forecasts. The fundamental difference of ABM Inventory order management system lies in a unique methodology, which is focused not on the forecast but on dynamic consumer demand. This considerably simplifies work and significantly distinguishes ABM Inventory stock and order management solution from other solutions that work according to the forecasting principle. The algorithm of the system is based on the methodology of the Theory of Constraints. Optimum web inventory system ABM Inventory for supply chain management with precision traces stock level of each SKU in real time, analyzing the actual sales, overstocks and out-of-stocks in each point of storage. Basing on these data the system places orders to suppliers. Besides, the inventory automation system at the enterprise provides clear understanding of what groups of goods are characterized with high turnover and bring the biggest percent of total turnover on the enterprise and which goods don’t make even 2% of total turnover. Knowledge of commodity stock movement gives a vector of development and releases the capital which otherwise, could be spent on groups of goods that would be better to remove from sale or production. Production inventory management software in-house development or usage of existing technological advancements of inventory and purchasing activities control can significantly transform processes, service quality, and reduce number of errors. Old-school manual process of commodity inventories replenishment becomes automated today, thus inventories is automatically supported at the ideal level in each point of storage to achieve maximum efficiency and productivity. Routine processes automation allows management to concentrate on more important strategic tasks, re-structure and improve worker processes, ask and accelerate access to necessary data and reports. Optimum inventory management system for each branch has certain specifics. Nevertheless, each business has to aim for human factor errors elimination to the greatest possible level. Therefore, purchase order management system implementation gives you essential advantages. Implementation of supply chain management software allows to release important resource of time for other fields of business. Also ABM Inventory it is wholesale inventory management software. The great role in Inventory optimization takes the option of exact and clear reports formation which display all data allowing to assess a situation objectively in general and graphically, and if necessary, to go deep into details. 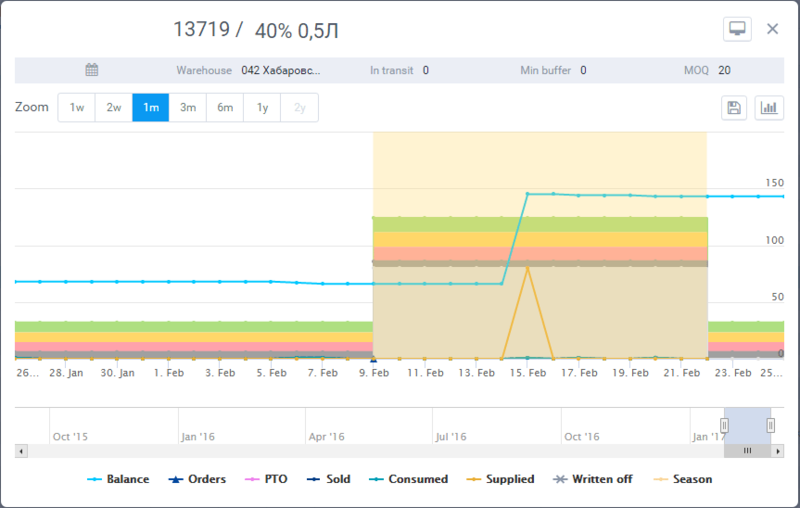 The inventory optimization solution generates more than 40 specialized reports to solve special tasks: reports on stock dynamics, sales, overstock, lost sales, reports on the analysis of assortment and turnover. Having made the necessary report, you obtain requested and structured information, which helps you to take reasonable administrative decisions. The system of reports opens for you a real picture of the current situation in the company: past actions and processes in your business, gives understanding of how to improve planning and to define the directions where to move further.